Flowerama delivers fresh flowers and flower arrangements to Canal Winchester every day of the week. We are a local owned florist, and have won the Consumers Choice award six straight years. Flowerama has four brick and mortar locations and we offer same-day Get Well, Birthday and Anniversary flower delivery to any Canal Winchester home. Order flowers online, use our mobile site, call us or visit one of our flower shops. 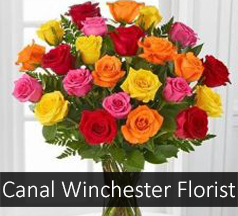 We also provide daily flower delivery to Canal Winchester businesses, Canal Winchester funeral homes, Canal Winchester schools, Canal Winchester hospitals, and Canal Winchester nursing homes.